The ‘thinking woman’: what is she? Who is she? I instantly picture a female version of Rodin’s sculpture, The Thinker. And swiftly discard it. When I come across a description of Benedict Cumberbatch as the ‘thinking woman’s crumpet’, I know just what that means. And when I read about a new magazine that’s aimed at ‘the thinking woman’, I know just who she is. 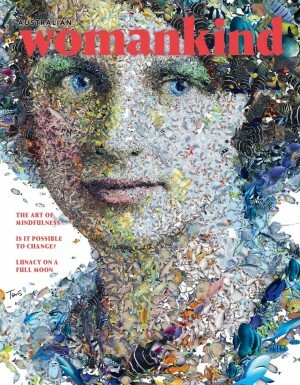 The Australian quarterly magazine Womankind, now a year old, has been described as the ‘thinking woman’s magazine’. It seems like a good way for me to get to the bottom of what ‘thinking woman’ might actually mean. 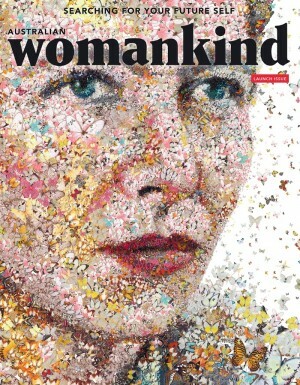 The magazine is laudably ad-free and lusciously design-rich, with a cover that, according to Women’s Agenda, was voted one of the top in the world by German media website MEEDIA within a week of the launch of its first issue (shown above). By its own account, it has sold remarkably well. I have Issue 4 right here at my elbow. 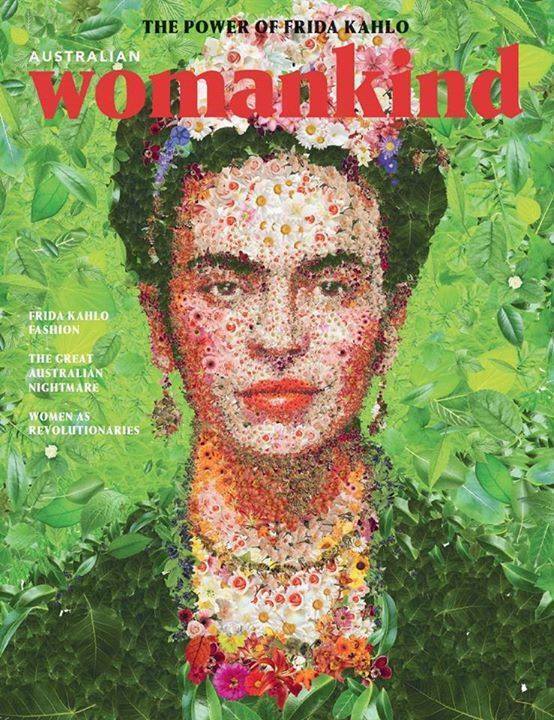 On the cover is a collaged image by Charis Tsevis of Frida Kahlo, composed of leaves and flowers. Each issue is organised thematically by country and by animal or insect: this issue it’s Mexico and bees. Accordingly, alongside the feature on Frida Kahlo herself is a photo shoot of ‘Frida Fashion’ designed by Austrian artist Susanne Bisovsky (not Bisovksy, as it is misspelled in the magazine); an essay on ‘Women as revolutionaries’ which focuses on the Zapatistas of Mexico; a piece by Charlotte Wood, ‘Cooking as revolution’; a short article about a town called Cherán in Mexico where the women held loggers hostage as part of a strategy to take back control of their local natural resources; ‘Memoirs of a volunteer’, written by Cate Kennedy about her volunteer placement in central Mexico; an article on magic realism which references (of course) Gabriel García Márquez’s One Hundred Years of Solitude; a photo essay featuring the work of Peruvian-born artist María María Acha-Kutscher; a feature on the vast border enforcement apparatus now in place between Mexico and the United States; and snippets on the Spanish-born surrealist painter Remedios Varo, and surrealism more generally. There is also a set of surreal photos from the series Flying Houses by French artist Laurent Chéhère. The bees are represented by visuals throughout; an article on colony collapse disorder among bee populations; a delightful visual bee glossary; a couple of short pieces in the beginning pages; and a profile of Katherine Lyall Watson, an urban beekeeper. ‘Flower hunter’, on the artist Leonie Norton, fits in nicely. At the end are reviews of books and videos that also relate thematically. And interwoven is content unrelated to the two themes, including the winners of the Womankind Photographers’ Award II; pages of contributions from readers logging their ‘No news week’ experiences; and an impassioned article by Alecia Simmonds, ‘The great Australian nightmare’, on Australia’s obsession with home ownership, which as I write is one of the five top reads on the Womankind site. The magazine is a feast for the eyes and mind. Within its quirkily chosen themes it provides good variety and quite a few delights, especially for those who enjoy art, and promises to cover fascinating ground in future issues. While it bears a certain relationship design-wise to its sibling magazine, New Philosopher, of which Antonia Case is Literary Editor, the many one-off textures and flavours in the design, especially the distinctive and striking endpapers, attest to the enormous amount of work that has gone into its creation, and well and truly set the magazine apart. Moreover, as much of the commentary around the magazine applauds, it steers away from the makeup and dieting tips, and the celebrity gossip, that we ‘thinking women’ have had enough of. That on top of the lack of ads make it a sort of safe haven from … certain kinds of messages about what women should want, or how we should behave, or what we are. It also strongly encourages the inclusion and participation of readers through regular competitions and challenges, as per the photographer’s award and ‘No news week’ sections mentioned above. There are other magazines in the Australian market that offer substantial food for thought without excluding, shaming or shamefully limiting women. I’ve already mentioned Dumbo Feather and New Philosopher. What about the literary magazines, such as Island (with its current headline article on Marina Abramović) or Overland, with its many articles by and about women and women’s issues? Is it that they are all too academic? Too specific in their focus? Too ‘token’ in their representation of women? Or not somehow soft enough? Not feminine? What is it Womankind readers are after? Who are these particular thinking women? The answer is: I’m not sure. For me, tantalising as it is, Womankind has its shortcomings. Foremost among them are lack of rigour and overuse of conventional feminine imagery. Especially flowers. The insistence on floral imagery reminded me instantly of the marketing of certain brands aimed at women – feminine products among them. It might have been the pastel hues of the first three covers. I’m not a flower hater. I love flowers. I thought Dumbo Feather’s cover for Issue 37, featuring Clare Bowditch – with flowers – was absolutely stunning. But it’s a one-off among the Dumbo Feather covers, and that’s because it’s tailored to Clare Bowditch. A series of covers featuring the faces of strong women re-envisioned as flowerbeds (admittedly Issue 2 actually uses fish, but the effect is, nevertheless, floral) seems counter to what Womankind is trying to achieve. I want to ask ­– Still flowers for us girls? – this is the best a brave new magazine for women can do? In Issue 4, the connection between Frida Kahlo and bold, botanical imagery makes sense, given the imagery in her art and her self-presentation. And this cover is glorious. But despite that connection, the bee and floral decorative elements begin to feel fussy and overused. There seems to be a bee or a flower on almost every spread, in a variety of styles. And sometimes those elements jar; for example, why on earth is there a bee fiddling across the sky in the ‘Frontier wars’ double-page photo, which shows part of the barrier between the US and Mexico, with two people behind it; the hint of tragedy? It is in complete contrast to the serious tone of the piece. Similarly, ‘The great Australian nightmare’ is encircled with a blue bee and flower frame on every page, with whimsical contrasting images of flowers and bees appearing on both spreads. The effect is infantilising, odd. While I appreciate the magazine is not aiming to be academic, it should surely aim to achieve rigour within its own parameters of short, thoughtful, meaningful pieces which look to a range of disciplines. Chloe Angyal’s article ‘Women as revolutionaries’ gives the impression, until well into the article, that the tens of thousands of Mexican Zapatistas are all female. If you didn’t know better, you’d think this right through until the third page, where she states ‘… of the six current spokespeople two are women’. In contrast, Angyal refers by name to six famous revolutionaries; only one (Aung Sang Suu Kyi) is female. This would be odd in any publication, especially given it is clear that Angyal is referring to a range of different types of revolutions, not merely the kind where arms and bloodshed are involved. But it seems particularly strange in a publication aimed at women. What of the suffragettes? What of – hell, why not – Germaine Greer? Truthfully, the whole theme of revolution feels a bit wistful. I think Charlotte Wood’s piece on ‘Cooking as revolution’ is very effectively framed by her description of her mother’s ‘undercover life as a rebel’ and her own adoption of her mother’s ‘subtle revolutionary lessons’ in the kitchen, even if there’s nothing groundbreaking in the tips that follow. But there’s no suggestion in any of these pieces that we have need of real revolution right now … not here. Actual revolution is presented more as a Good Thing, generally. Something an Australian thinking woman would value and support from afar, but not actually participate in, let alone lead. Moving on: I am puzzled by the sheer number of pieces which blend elements of pop psychology, philosophy and spiritualism – from ‘Memories of our ideal self’ to ‘Subterranean journeys in sleep’ to Flora Michaels’ ‘Where you stumble, there is your treasure’, which references mythologist Joseph Campbell’s ‘hero’s journey’; not to mention a short piece on feng shui. To have one or two such pieces in the whole of the magazine would be simply to represent – to be inclusive of – a certain point of view. To have a cluster of such pieces, several of them written by the editor, tends to suggest that this is the voice, the perspective, of the magazine itself. Putting aside the piece on feng shui, which along with ‘The big five personality test’ (also written by the editor) seem to be fairly standard ‘lifestyle’ fare, and putting aside also ‘Where you stumble, there is your treasure’, which is a more substantial essay on the nature of change, we’re left with the two short pieces by the editor: ‘Memories of our ideal self’ and ‘Subterranean journeys in sleep’. ‘Memories of our ideal self’ posits the idea of an ‘ideal’ self, as reflected in others we meet and remember long afterward. It’s incomplete – strangely unsatisfying – and ends abruptly on the question ‘why is this?’ which seems simply to steer us away from trying to understand the idea already put before us. ‘Subterranean journeys into sleep’ begins as a consideration of the uncharted journey of our lives, and particularly of our ‘journey in dream’. It then looks briefly at the way dreams have been viewed historically, and then veers into a critique of what science has done to the way we look at dreams today. Again it ends with a question: ‘… we mustn’t forget the response demanded by philosophers to the important question: “Why?”’ Why what, in this context? It isn’t clear. These two fragments would not be out of place in a private notebook or blog, or in correspondence with a close friend. In such contexts, this kind of writing, despite its fuzzy thinking, suggests thoughtfulness, a questing spirit, a desire to get beyond the mundane. Its presence, however, in a magazine that purports to lift the bar intellectually for women, is problematic: it gives the ideas a credibility, a sheen of authority, they don’t deserve. Such writing seems also to reflect a certain concept of female sensibility as being raw, naïve; explicitly valuing of multiple ‘subjectivities’ and minimal filtering or editing of those subjectivities. While being a valid way to view what a female sensibility can look like, particularly historically and in contrast to the notion of an enshrined and exclusive male sensibility, surely these days we would not be inclined to accept it as a sure-fire guide to the kind of stuff women want to read? I have to admit also that I was outright startled by the assertion, in ‘Subterranean journeys into sleep’, that scientists ‘continue to stifle thought with their bibles explaining how neurons secrete and fire’. Which is as good as to say, we women thinkers aren’t having a bar of this science business. Whoa! Believe me, if we were paying attention, we’d see how many scientists, many of them female, are doing their absolute best to open up our minds. 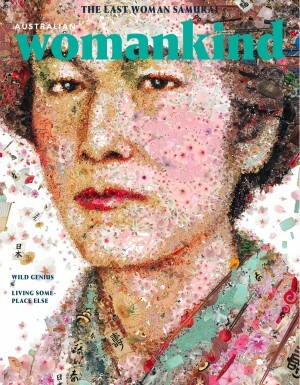 Come to think of it, we have a sociologist (Ruth Quibell) and an ecologist (Jo Immig) among the writers of Womankind Issue 4. Are these somehow the right sort of scientist? And the other sort, not? The overall effect I come away with is of thinking lite. A wonderful, enchanting smoke-and-mirrors performance designed to make us feel we’re getting somewhere, while we remain right where we are. What does it mean, to really think? It’s something we’re supposed to get from a decent education – or at least, that used to be the idea. The ability to take nothing at face value – to look at information from different aspects – to weed out the valuable from the irrelevant – to develop an instinct for when further information is required to understand something properly. It works towards a true understanding of a concept, a phenomenon. 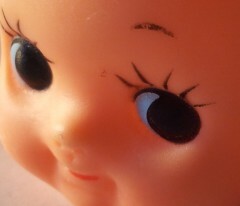 Great thinking makes leaps, joins intimate understanding with creative process with the desire to understand, to solve. There’s a hunger to it. It rips through the tacit, the cozy. It’s unconcerned with getting an A in social graces or appearing to be on talking terms with surface knowledge. Reminds me of Sherlock, really. Could he be right? Could being described as a ‘thinking woman’ say more about your social status and attitudes than about what you do with your mind? Womankind, where it trips up, seems to suggest this analysis of the thinking woman (its reader) is right, in the way that it caters to certain predictable tastes and assumptions; in the way that it remains safe, and not too challenging. Yet I am certain it is aiming at something more: substance as well as style; a genuine exploration of the world; a desire for understanding and for change. In the belief that the woman who thinks is, after all, a game changer – a real revolutionary.